The weather hasn’t been too bad here in Fredericksburg—with mild temperatures and a little bit of rain here and there, it almost feels like spring in the Mid-Atlantic! While there’s probably another three or four feet of snow to come in the next month, it’s certainly not too early to start thinking about the spring season—and spring cleaning. There are plenty of ways to tidy up your home when the weather warms up—but how about tidying up your home’s indoor air quality as well? There are plenty of ways you can clean up your home and your HVAC system so you can breathe cleaner air and save money on your monthly energy bill—let the Fredericksburg HVAC professionals show you have it’s done! Fredericksburg isn’t exactly a dust bowl—but there’s still plenty of pet dander, chemical residue, dead skin flakes, clothing fibers, fireplace ash, and dirt that can pile up in your home. You know that’s what dust is made of, right? It’s your Uncle Wade’s skin, pieces of an old sweater, dirt you dragged into your house on the soles of your shoes, and some Clorox bleach remnants from the last time you cleaned your kitchen floor—a true Heinz ‘57 of gunk and grime. Dust doesn’t just dirty up your home—it can cause allergies and respiratory problems for you and those you love most (even your pets) and it will almost certainly affect the function of your HVAC system. When dust gets built up in your HVAC system, it makes your HVAC unit work harder and harder to achieve your desired temperature—and that can spike your energy bill by up to 15 percent annually and even cause costly damage to your HVAC system. To keep dust at bay in your HVAC system, you must keep dust at bay throughout your entire home—so give things a solid dust and a mop frequently to minimize dust buildup. You’ll breathe easier, your HVAC system will operate in a more efficient manner, and your house will be clean to boot! Your filters are responsible for trapping dust and other debris that travels through your air ducts—but if they’re too full of dust to begin with, they’re going to let go of old dust as they trap new dust. This obviously doesn’t do you any favors in terms of indoor air quality, and it certainly doesn’t help your HVAC system operate in an efficient manner. 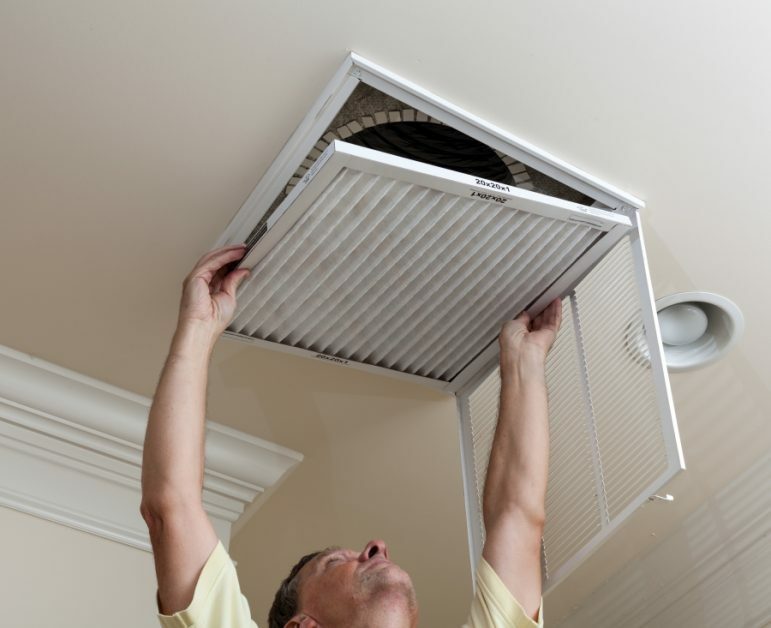 Most professionals recommend changing your HVAC filters with every change of season. However, if you’re prone to allergies or respiratory problems, it’s probably best to change out your filters monthly to keep your air as clean as possible. Not sure what type of filter you need, or how to change out your filter? Just call the professionals at All Air—we’re happy to help. Your air ducts transport perfectly conditioned air through your home—but along the way, some little bits of dust and debris get stuck in your ducts before they make it all the way to the air filter. This dust and debris can get knocked loose with a heavy stomp or a slam of a door—and that can increase the likelihood of poor indoor air quality. At least once per year, call the professionals at All Air to have your air ducts professionally cleaned. We can also give your entire system a tune-up and check for potential problems through your system chain. Don’t wait until it’s too late—call the All Air team to schedule an appointment today!